Problem: The customer was using an out of date manipulator that caused them to manhandle the part. The HVAC handler was bulky and slow resulting in a task time that was unacceptable. Also, the previous manipulator was only built to handle parts that were quality acceptable. Hence, the operators had to bend over with the manipulator to place the rejected parts onto the ground. Lastly, the custom tooling on the previous manipulator had nothing to insure the parts would stay in place. If the part was picked up and the tooling was moved too quickly, the part could come loose with the potential to cause injury. Solution: We integrated a Gorbel zero gravity, high speed PLC controlled servo driven hoist (Gorbel G-Force) with a custom fork and vacuum tool. The vacuum portion of the lifting tool was set up to only release if the weight was removed from the tooling. A custom proximity sensor ensures that the product will not be released in mid-air. The forks on the tool were rounded and coated with a UHMW pad to avoid accidental product scratching. The handle was built to float with the lift tool. 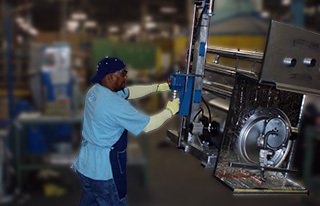 This kept the operators hands in good ergonomic positions at all times, and solved the operators problem of bending over to grab or set down the part. Result: This HVAC lift assist was integrated with a Gorbel G-Force for high speed precise placement which improved worker safety and increased production.